How can your city best weather an economic downturn? Based on research, make sure it has a university. As reported in New Geography’s College Towns: High Marks for Lifestyle, college towns consistently have unemployment rates below their state figures, and nationally as well. Columbus, Ohio (Ohio State University) stands at 8.9%, below the 11.2% state and 9.4% national rates. Manhattan, Kansas, (Kansas State University) rates at 4.6%, the second lowest small city rate in the nation, and Iowa City, Iowa, (University of Iowa) at 6.2% (pictured). Why the resilience of university towns? – For one, universities don’t typically suffer from massive layoffs of students. In fact, I’m sure we all know at least one person who had difficulty finding or keeping a job that considered returning to school. That provides a constant population of residents and consumers for local businesses, kind of like why toothpaste companies don’t suffer in economic downturns. – Graduating students translate to educated candidates to start new businesses or infuse existing ones with fresh, innovative talent. – Former graduates are returning to the towns they want to school in, according to Tom Wetzel, founder and president of the Retirement Living Information Center. If you’re retired or laid off, why not return to that sense of community and camaraderie you had in school, from intellectual pursuits to the big football game. Blacksburg, Virginia (Virginia Polytechnic and State University) and Davis, California (University of California) are favorite return destinations because of the strong sense of community and purpose they establish with their students. 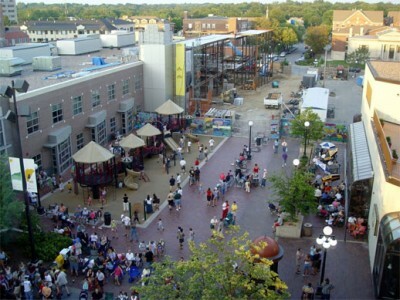 Photo of Iowa City’s downtown pedestrian mall by Kables. Unfortunately — and ironically — the one profession in which it’s really hard to find work in a college town is teaching. The colleges crank out an endless supply of cheap, freshly degreed job candidates.